for Foreigners and International Couples. You are a non-native Japanese resident in Japan but enjoying your life in this country. That’s great! I love this beautiful country, too. 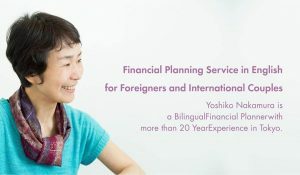 However there are many challenging issues that come with living in a foreign country, especially regarding financial matters. If you are an International couple, you also may have a lot of questions or problems neither your friends nor family can answer. with more than 20 Year Experience in Tokyo.